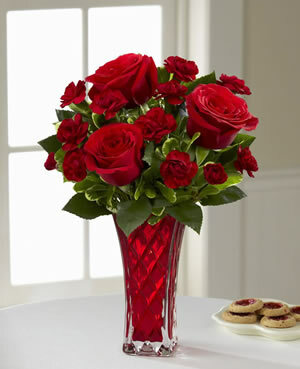 Sweethearts Bouquet make Valentine's Day bloom in shades so passionate, there's no mistaking what's in your heart. Red roses are even more brilliant when paired with burgundy mini carnations and lush greens in a heavy red glass vase with a cut glass diamond pattern. Makes a lovely gift to sweep a certain someone off their fee this February 14th.